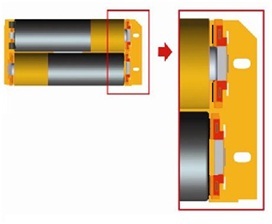 Basically battery comes with two polarities and in order for it to work correctly, users have to insert it in right position so that the battery charge can be sourced accordingly. While it seems to be quite simple to identify the correct polarity, but some devices may not have very clear instruction that can add to confusion. And that is how this innovative technology is useful for. Named as InstaLoad technology, it is a new battery installation technology introduced by Microsoft with intention to enable users placing the battery in any orientation as they prefer. InstaLoad is claimed to purely based on mechanical design enhancement that include a set of positive and negative terminals at both ends, hence eliminating the need of special circuitry that may complicate the design with extra cost. And when contacted with correct PCB traces, proper electricity loop can be established. Some benefits are obvious and by having this technology in place, users no longer need to care about how the battery should be positioned, and instead, just put them as they would like it to be ready for use. InstaLoad technology can be applied to any types of batteries such as AA, AAA, C or D types. No actual availability yet, but Microsoft starts to offer licensing for its Intellectual Property so its potential licensees can develop new prototype based on this brilliant concept targeted for commercial market in short future.